A couple of Sundays ago, I trekked out late in the afternoon to Columbia Station, entirely forgetting that my intended destination was 22nd Street Station in sunny New Westminster, British Columbia. The reason for the trip to Vancouver's suburb to the south: to explore the neighbourhood as I did for New Westminster Station portion of my SkyTrain Explorer heritage walks around the Greater Vancouver area. Limited at this time to Vancouver proper, Burnaby and New West, the book by John Atkin details the history of buildings and surroundings of SkyTrain stations in the Lower Mainland. First up, Grimston Park. Mislabled in Google Maps "Grimstone Park", the sign on the park assures us otherwise. Sitting on the benches facing south gives you a good view of Surrey and the passing SkyTrains. Onwards from there we pass by storied houses, and Atkin leads us to the neighbourhood school and a church converted from a house. A fairly interesting, if overwhelmingly residential, neighbourhood. 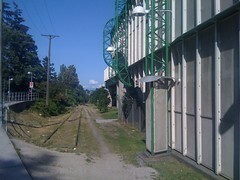 Of 22nd Street Station itself, the builders retained a small part of the Highland Park rail line beside it. I've done 9 walks now—10 if you include the Metrotown Station walk, which consists of walking through the mall—and have 5 to go. The remaining walks happen in Vancouver, and I'd like to do a group walk at some point around Broadway Station, a station that serves as a hub for the system as it shares space with Commercial Drive Station. The 22nd Street Station walk (Flickr set with a semi-accurate map) wraps it up for the New Westminster portion of the SkyTrain Explorer tours. John Atkin does not, in this edition, have a tour for Columbia Station nor for any of the Surrey stations. I hope that in a subsequent edition he'll also include stations on the newer Millennium Line and possibly, for a third edition, walks around Canada Line stations. For those who want John Atkin himself to lead the tour, it's not too late to sign up with the CIty of Burnaby. At this writing, he will guide you through the Royal Oak and Edmonds portions of the book, which I've already covered in my series.